The term ladder may also refer to a ranking system used within clubs. See Club Ladder for details. A ladder is a technique for capturing stones. At each step the attacker reduces the defender's liberties from two to one. There are plenty of Ladder problems and exercises in Sensei's Library. Black starts a ladder to capture the stone. If White tries to escape, Black can at each time play atari and White will be captured. Clearly White should see this and not play . Ladders may span a large part of the board. 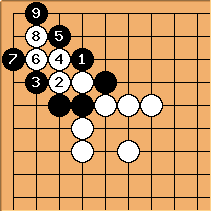 If for example Black captures the white stone in a ladder with , the ladder will cross the entire board if White tries to escape, resulting in the next diagram. If White tries to escape, the ladder will continue in this way. This is a disaster for White. After , is suddenly in atari. 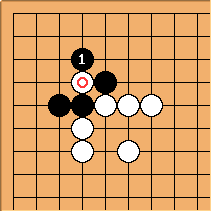 Now, black cannot continue with the ladder, because white could simply capture the stone. The ladder is broken. 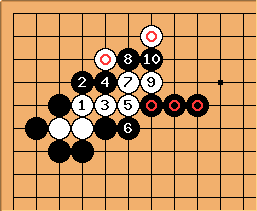 Also, note that black's formation is full of cutting points each of which is a double atari that White can play. This is therefore a disaster for Black. And so we can plainly see that a ladder is little more than a one-sided fight for one side or the other. Hence the proverb, "If you don't know ladders, don't play go". Although ladders normally follow a zigzag pattern across the board, and indeed derive their name from this "stairway" like formation, any sequential series of ataris forcing the opponent's stones around is considered a ladder. Thus ladders may go straight, or bend, and still be considered ladders. 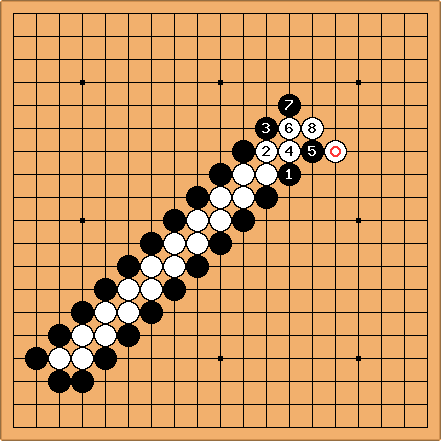 In this example, there are several white ( ) and black ( ) stones in the path of the ladder. The diagram shows that white cannot escape with . Had black followed the basic zigzag pattern by playing at , white would have escaped. 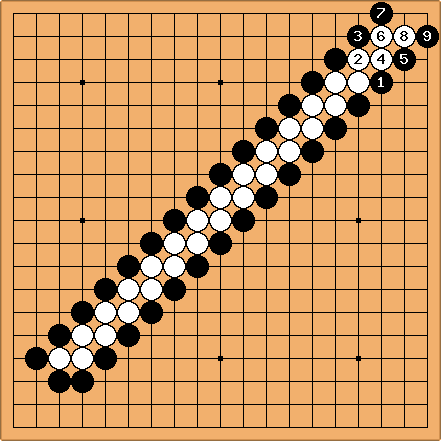 But by using his own additional stones for support, black is able to maneuver the ladder past white's stones. In the same vein, this pattern is also a ladder, though most people might not refer to it as such. The Chinese term for "long march", 长征 (cháng zhēng), is often used as a metaphor for the Chinese term for "ladder", 征子 (zhēng zǐ). 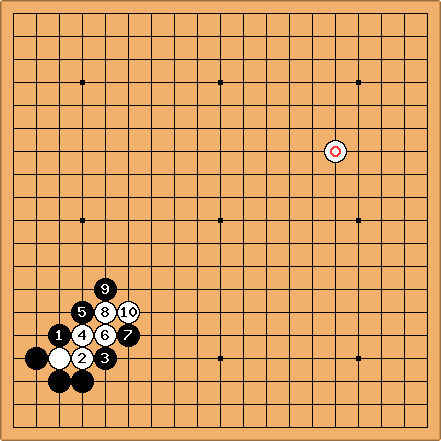 The idea is that if the ladder is played out fully, then it can be a very long sequence, like a long march. According to John Fairbairn, the word 征 first appeared in Chapter 2 of Dunhuang Classic in the 6th century, well before Mao Zedong's time, and there is no reference there to marches. In the ancient, 征 refers to firmly attacking a rebellious state and had nothing directly to do with marching, but later it developed to another meaning of "(military) expedition".